Roofs get hot in summer, causing attics to heat up, too. Much of that heat radiates into living spaces below. Dr. Energy Saver can keep your attic cool with a radiant barrier. Dr. Energy Saver Connecticut installs radiant barriers in attics and are experts in saving energy through your attic, as well as many other parts of your home. For your Free Radiant Barrier Estimate in Connecticut, call or e-mail us today! 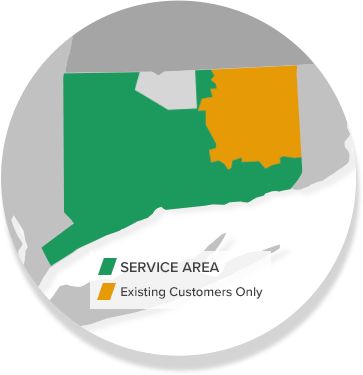 We serve Norwalk, Stamford, Darien and surrounding Connecticut areas near Greenwich, New Canaan, Danbury, Westport, Ridgefield, Hamden, West Hartford, Cheshire, Milford, Trumbull, Shelton, Bridgeport, Hartford, New Haven, Waterbury, New Britain, Bristol, Meriden, Glastonbury, Monroe and Stratford. Radiant barriers are sometimes referred to as "reflective insulation" and "radiant barrier insulation" because, similar to insulation, they can effectively slow the transfer of heat. Your Dr. Energy Saver consultant will help you decide on the one that's best for your home. In an attic, the radiant barriers we use can work just like these shiny car shades. When it's hot, up to 97% of the sun's heat can be reflected back outside by a radiant barrier. There are several ways to add a radiant barrier to your attic, including reflective sheeting, between-rafter panels, and rigid insulation panels faced with a radiant barrier. Dr. Energy Saver Connecticut can install a radiant barrier against the bottom of your rafters (or between them) to help improve cooling efficiency in the summer and heating efficiency in the winter. Call or e-mail us for a Free Estimate for radiant barriers. Installing a radiant barrier in an attic cuts air conditioning expenses by 10% or more. Expect the highest savings in warmer climates, where the workload on AC equipment is highest. Homeowners in northern climes can benefit, too -- especially when HVAC ductwork and the air handler is located in the attic. Dr. Energy Saver Connecticut provides radiant barrier and insulation to Hartford, New Haven, Greenwich, Norwalk, Danbury, Stamford as well as surrounding areas such as Westport, New Canaan, West Hartford, Darien, Hamden, Ridgefield, Cheshire, Milford, Trumbull, Shelton, Bridgeport, Waterbury, New Britain, Bristol, Meriden, Glastonbury, Monroe, Stratford. Call 1-855-201-5406 or contact us online for a home energy evaluation and insulation estimate.